Scotland defender Christophe Berra says England "have everything to lose" in the 2018 World Cup qualifiers between the two sides. The countries were drawn alongside each other in Group F with Slovakia, Slovenia, Malta and Lithuania in St Petersburg on Saturday. "I think England won't be looking forward to it, they've probably got everything to lose," Berra said. "They know and we know we've improved dramatically under Gordon Strachan." England will face Scotland at Wembley on Friday, 11 November 2016, with the return game in Scotland to be played on Saturday, 10 June 2017. The Ipswich defender added to BBC Radio Suffolk: "It's going to be a tough game for them - we'll be looking to win." The two rivals have not met in a competitive game since the Euro 2000 play-offs in 1999, which England won 2-1 on aggregate, but have played two friendlies in recent years which England have both won. 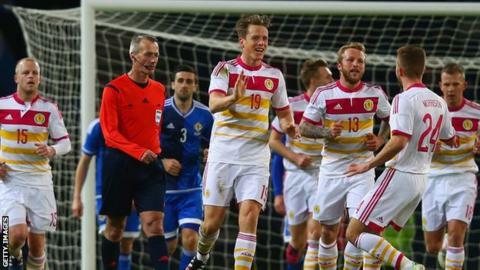 However, Scotland are performing well in the Euro 2016 qualifiers, having drawn away to Poland and the Republic of Ireland, as well as losing narrowly in Germany. They are currently third in their group, two points behind world champions Germany. "We've got four games left and we'll know our fate by the end of October," Berra said. "We'll take it one game at a time, like we have done throughout the whole campaign. "Our next game is Georgia away. We beat them 1-0 at home but they're no mugs. They're a good technical team and we will need to be on top form to get a result from that."